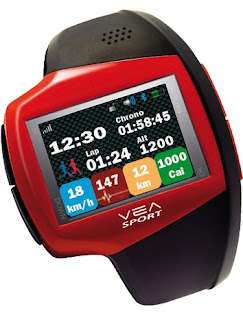 Vea Digital has introduced a new watch, Sportive, which has a 1.5 inch touch screen that could make telponan. This advanced digital clock device offers various features such as smartphones, allowing users to take advantage of the camera, GPS, 8GB of onboard storage, MP3 player and Bluetooth connectivity. The interface on the smart watch is intended for athletes, allowing runners to monitor the lap times, heart rate, instant speed, and altitude. GPS data can also be used in emergencies, with special SOS button sends location information to a third party service. Sportive is expected to be marketed on July 14 at a price of € 399 (~ $ 575 USD), in which prices will bead to € 499 (~ $ 719) USD in September 2011.